Look for the Long Pond Trailhead marker near the pump house and follow the pleasant lakeside trail as it heads roughly northwest around the pond. After passing the junction with the Perpendicular Trail (link), the Long Pond Trail continues along the pleasant shoreline for almost two miles, passing through several open rocky sections and forested sections. A spot of note is "Duck Rock," an outcropping that offers a more expansive view to the north. Soon enough, the trail leaves the pond and turns southwest to head up the rolling slopes of Western Mountain. 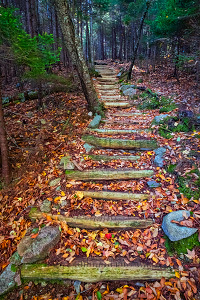 The Long Pond Trail ends in the middle of the forest at the junction with the Great Notch Trail. If turn right and take the trail northwest, this 1.2-mile stretch leads to the remote Long Pond Fire Road. (If you have the extra time, it is a pleasant stroll through the forest although there aren't really any outstanding features.) 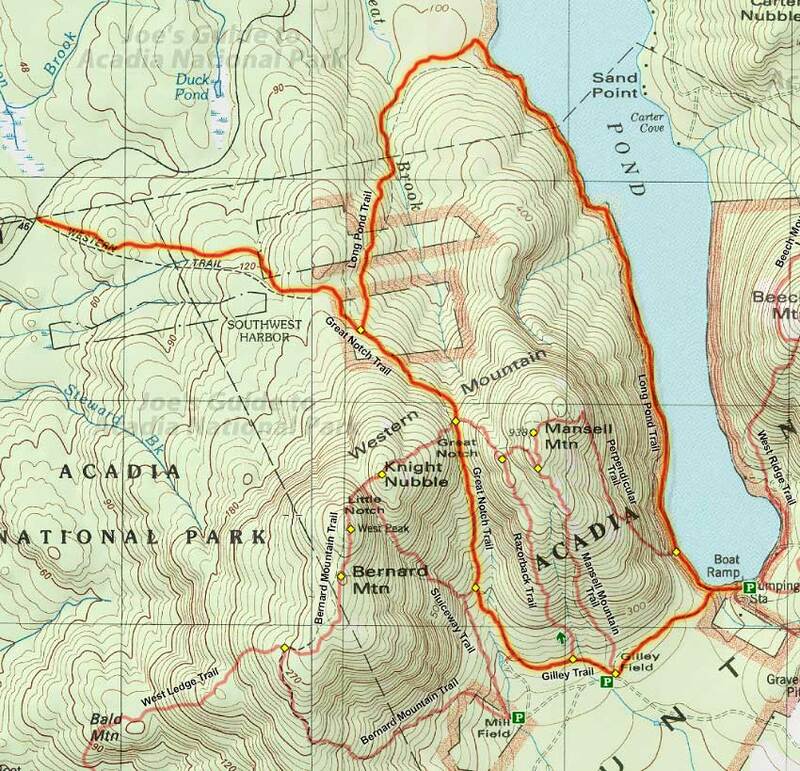 Or heading southeast from the junction, it is roughly .4 miles of uphill hiking to the "Great Notch", the pass between Mansell Mountain and Bernard Mountain. While it isn't as photogenic as its name would imply, it's a pleasant spot and a trail junction with the Razorback Trail and the Bernard Mountain Trail. While the Razorback Trail is the more scenic option, continuing down the Great Notch Trail is a pleasant walk in the woods and depending where you parked (Mill Field, Gilley Field, or the south shore of Long Pond), you may continue on the Gilley or Cold Brook connector trails to complete your loop. 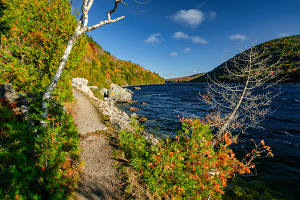 While there are admittedly a plethora of more dramatic trail options in the area, this loop hike includes some pleasant lakeside and forest scenery similar to the touristy Jordan Pond. This might be an enjoyable hike for those looking for a less strenuous stroll, but there is a bit of an uphill push to the Great Notch.